You consider yourself a handyman who can tackle projects of all sizes around the house. If you haven’t had experience installing solar panels before, then you may need a little bit of guidance. In this guide, we’ll walk you through the installation process so you can install those panels by yourself. The solar energy industry is booming! In Q1 of 2018 alone, enough solar panels were installed to power 10.7 million homes in the United States. It’s not hard to see why. You save on energy costs, it’s very environmentally friendly, and you can receive tax credits for using solar energy. There are a thousand good reasons to start utilizing solar energy. But the initial costs can be high. Installing your own solar panels could save you a lot of money. And while it might seem daunting to tackle that project on your own, with our guide to installing solar panels, it’s simple as can be. The following guide includes things that solar installation companies might charge to evaluate or do. So crossing them off the list yourself could save you money! Read on for everything you need to know about how to install solar panels. If you live anywhere in the northern hemisphere then you might assume that the best direction for your solar panels to face is south since it will receive the most exposure to the sun. But you would be wrong! Research shows that west-facing solar panels produce about 49% more energy than south-facing ones. So if you have a choice, west-facing panels will be the most efficient. If you don’t have west-facing sections of roof, then south facing is the next best option for those living in the northern hemisphere. If you’re a part of a homeowners association (HOA) make sure to check whether they have restrictions on the placement of solar panels. Legally they can’t restrict you from having or using solar panels, but they may try to regulate their visibility. Solar panels have to be exposed to direct sunlight in order to convert the light to energy. The most common light obstructions are trees. We can’t advocate for cutting down your neighbors’ trees. But if there are any trees in your own yard that are shading (or will soon shade) the panel area it would probably be best to have them removed. This will make your solar panels much more effective which will result in a much higher return on investment for you and your family. And isn’t this one of your main goals? Next, let’s talk about the quality of your roof. It’s a wise idea to evaluate the condition of your roof before installing solar panels. It can be time-consuming and costly to remove and put the panels back on if your roof needs to be replaced at a later date. So if your roof needs repair or is nearing the end of its time in use, consider repairing or reshingling prior to solar panel installation. Doing so will save you time and money in the long run. We recommend purchasing a DIY solar panel system kit. They contain all the necessary equipment to install panels on your own and always come with helpful directions. You can also purchase the pieces separately. Whether you buy a DIY solar system kit or build your system from scratch there are a few pieces of equipment that you’ll need to buy. Solar Panels: The flat panels that convert direct light to DC (direct current) energy. Charge Controller: This equipment prevents your battery from overcharging and wearing out. Battery Bank: This allows you to use energy created by the solar panel when the sun isn’t shining (like at night or on cloudy days). Inverter: This converts the energy that is created by the panel (direct current) to the energy that your home and most of its appliances use (alternating current). Stanchions, Mounting Racks, or Platform: This is what you’ll use to secure the panels to the roof. Meters: If you maintain a utility connection you’ll need a meter to monitor your usage of utility power. Backup Generator: If you sever all utility connection then we recommend having a backup generator in case of emergency. The only thing that remains is the installation! If you purchase a DIY solar panel system kit, you’ll have specific instructions that will guide the installation process. It follows a few basic steps. Secure the mounting racks, stanchions, or platform to the area of the roof where your panels will sit. Connect the solar panel(s) to the mounting rack. Connect the battery pack and charge controller. Wire the system to connect to the electrical system inside the home. This step will include securing the wire to the home and weatherproofing it. Connect the meter if you plan on maintaining a utility connection as backup. You can find a more comprehensive tutorial here! 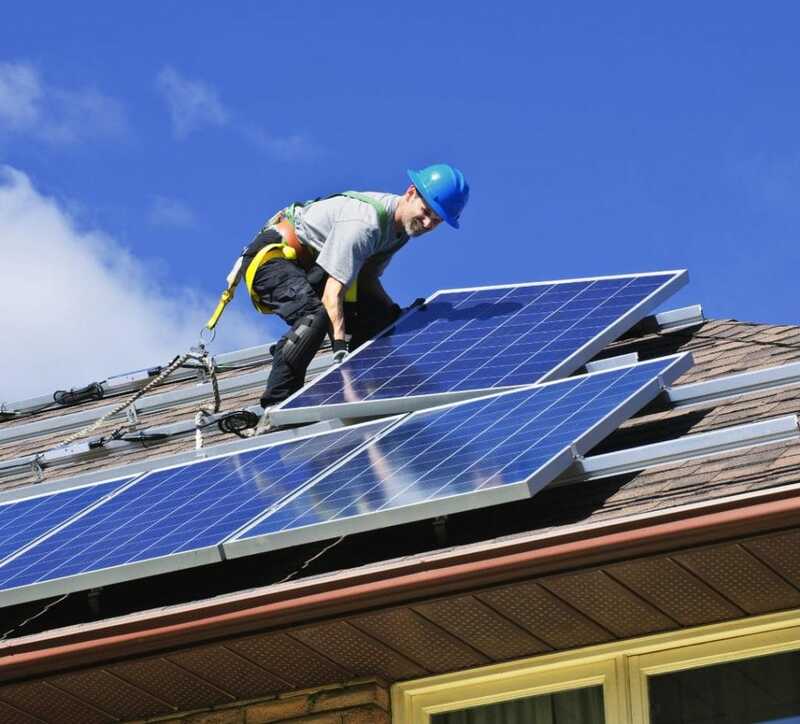 Pro Safety Tip: Because solar panel installation has to be done on the roof, make sure you use adequate safety measures and equipment to prevent injury. When performing any work on the roof of a home, you should be accompanied by another adult who can provide first aid in case of an emergency. 6. Enjoy Your Wallet and Environmentally-Friendly Energy Source! Once you’ve installed your solar panels, you can enjoy an off-the-grid experience with the peace of mind that comes with using renewable energy! Research showed that in Missouri the estimated 20-year savings from switching to solar energy was over $30,000. Sometimes, you can even qualify for Missouri solar rebates. That same study showed that every single average-sized solar panel system in the United States would save 6.3 metric tons of carbon emissions. Think about all the energy you’re saving when utilizing solar panels, not to mention the amazing financial savings as well. Both of these factors can be hugely beneficial in the life of you and your family. Whether you’re interested in roof solar panels for financial, environmental, or both reasons, you can conduct the installation yourself! Thanks for reading our guide on installing solar panels! Next up is our guide on DIY Wide Plank Floors. Check out our DIY Home Improvement feed for more projects!